Magento Featured Product Slider : This module is very useful for displaying your featured product in a very beautiful slideshow of next - previous style . Magento Featured Product Slider - This module is very useful for displaying your featured product in a very beautiful slideshow of next - previous style . Copy Or Install the files in their corresponding location in magento_root folder. Now Go to System->Cache Management flush all of cache Memory. Admin will set number of characters to display. Admin will set height and width. Admin will enter product ids separated with comma, which they want to display as featured product. After the system configuration is done, then customer can view a beautiful slider with image, description about that product and back-front arrows to change the slide. This slider can be used in multiple places in a single page. 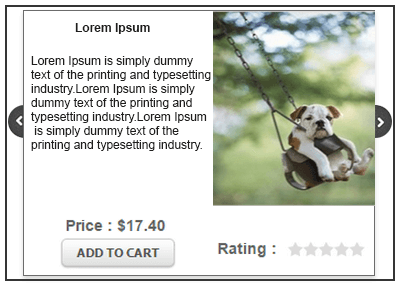 Customer can view slider with image, description about that product and back-front arrows. Slider can be used in multiple places in a single page. 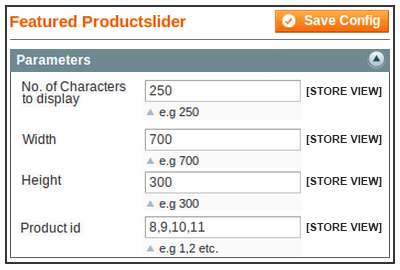 Did you buy Magento Featured Product Slider?